In the sacred place of Tenochtitlan, archaeologists from INAH-Conaculta (The Mexican National Institute of Anthropology and History and the Mexican National Council for Culture and the Arts), have found 23 tombstones over 550 years old, with etched images of snakes, prisoners, ornaments and warriors, which, as a whole, appears to depict the story alluding to the birth of Huitzilopochtli and the origins of the Holy War between the Mexicas. The tombstones are located in front of the remains of the Tenochtitlan Templo Mayor (Ancient Temple), in Mexico City’s Historic Centre, next to the circular platform adorned with snakes’ heads, discovered in September 2011. The tombstones are laid out purposefully along a path consisting of slabs of pink and balsaltic andesite (measuring 16.7 metres in length and 3.3 metres in width). Its height corresponds to the 4th stage of the construction of the Templo Mayor which was built between 1440 and 1469, during the Tlatoani government of Moctezuma I. The location and the layout appear to match the references found in the General History of the Things of New Spain by Bernardino de Sahagún and in The History of the Indies of New Spain, written by Diego Durán and in the Boturini and Chimalpopoca codices. On 15 March 2012, Nuria Sanz from the UNESCO World Heritage Centre, accompanied by the archaeologist, Raúl Barrera, Head of the INAH Urban Archaeology Programme, and Inti Muñoz, Director General of the Historic Centre of Mexico City Trusteeship, visited the site. During the visit, they discussed the circumstances of the find and the type of archaeological supervision needed for the works being carried out for the adaptation of the new vestibule which will be used as the entrance to the museum and the Prehispanic site. They talked about the aspects relating to the methodology which should be implemented to ensure an intervention of integrated conservation, as well as the spatial and historic connection between the new finds and the circular structure, found at the end of 2011, in the surrounding area. In addition, they debated the issues concerning the conservation work carried out by the team of restorers of the Templo Mayor. INAH’s representatives mentioned the possibility of making an archaeological window or a walkway so that citizens and visitors can admire the splendour of the platform. They also visited the remains of the Prehispanic building of approximately 15 metres in diameter, which could be a cuauhxicalco of the sacred place for Mexicas. The circular structure is over 500 years old and is decorated with 19 sculptures of snakes heads, embedded by architectural nails. Alfonso de Maria y Campos, Director General of INAH, had already announced the news of this 5 metre deep Prehispanic building, found in September 2011, which matches construction stage 4B of the of the Templo Mayor (1469-1481). So gradually we are completing the architectural topography of ancient Tenochtitlan, which according to the chronicles, comprised of 78 Prehispanic buildings in the holy place. 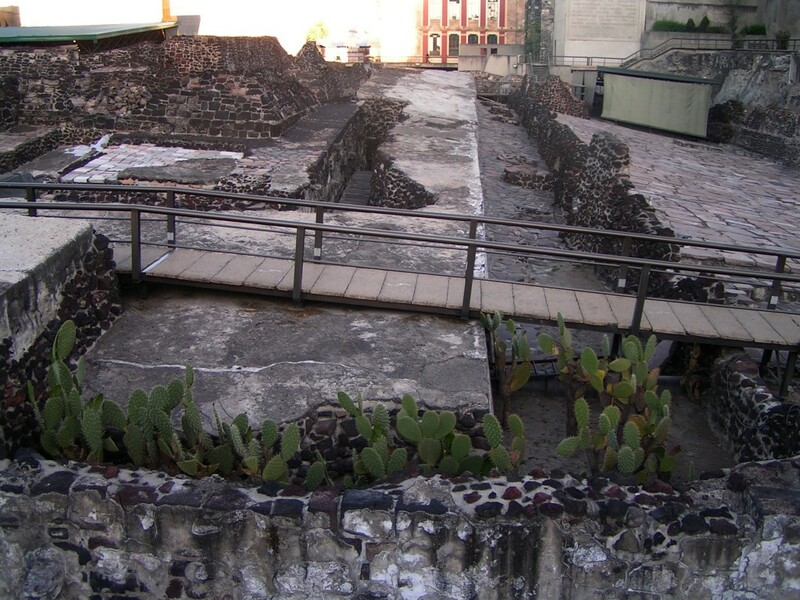 The discovered Prehispanic building is located to the southeast of what was Tenochtitlan’s main square, in front of the Templo Mayor, where now the República de Guatemala street crosses, and a few metres from where the monolith of the Goddess Tlaltecuhtli was found in 2006. We believe it important to emphasise that the intervention is being carried out thanks to the collaboration of several INAH departments, who are joining forces to continue this project of creating the Templo Mayor vestibule. The following national departments have together created a coordination platform to take on this fascinating process: Archaeology, Preservation of Cultural Heritage, Works and Projects, Historic Monuments, Museums and Exhibitions and the Council of Archaeology. The UNESCO World Heritage Centre considers that this permanent research project being undertaken in the Templo Mayor is fundamental to continue reinforcing the Outstanding Universal Value and its means of preservation. The new finds highlight, without a doubt, two histories of two different cultures in Tenochtitlan. Thanks to archaeology, this contact is starting to readdress the balance of our knowledge. To many more successes!